The University of Michigan is one of the world’s premier sites for training in African history. Michigan’s program is distinctive for the breadth and depth of the training that doctoral students receive. Professor Emeritus David William Cohen, one of the architects of the field, plays an active role in Michigan’s intellectual community. Several faculty members work on North Africa in various time periods, among them Joshua Cole, Juan Cole, Hussein Fancy, and Ian Moyer. Farina Mir and Mrinalini Sinha study the relationship between eastern and southern Africa and the world of the Indian Ocean. Michigan’s Africa scholars encourage doctoral students to learn vernacular languages and engage in long-term fieldwork. The student-led African History and Anthropology Workshop (AHAW) is a fulcrum for intellectual life. Founded in 1997, it is a venue for training doctoral students in historical and ethnographic thinking and practice, and offers a forum for U-M and visiting scholars to share and debate precirculated works-in-progress in regular sessions. Outside the History Department U-M offers many opportunities for students to enrich their study of Africa. The Department of Afro-American and African Studies offers a range of classes at the undergraduate and graduate levels. Its faculty include a number of distinguished Africa scholars: anthropologists Kelly Askew, Elisha Renne, Omolade Adunbi, Amal Fadlalla and Mike McGovern, politics scholars Adam Ashforth and Anne Pitcher, art historians David Doris and Ray Silverman, sociologist Martin Murray, literature scholars Fernando Arenas and Freida Ekotto, and economist Howard Stein. The African Studies Center, founded in 2008, coordinates the research that U-M scholars do in collaboration with African colleagues. The ASC annually hosts a cohort of 14 Africa-based scholars, who come to Ann Arbor for six months of sabbatical. The ASC also supports a series of academic conferences—in the humanities, the social sciences, and the hard sciences—that rotate between Michigan, Ghana, and South Africa. The Joint Program in Anthropology and History is an interdisciplinary training program for doctoral students. It is a lively and sociable space where students are encouraged to pursue questions that lie athwart conventional disciplinary boundaries. At Cambridge and at Michigan Peterson has supervised doctoral students working in a range of fields: on African-run churches in South Africa, on Christianity and the Rwandan genocide, on the intellectual cultures of the Buganda kingdom, on pan-Africanism in Tanzania, on Zulu-language literature, on women and fashion history in Idi Amin’s Uganda, on mental asylums in the Gold Coast, and on urban reformism in socialist Mozambique. At the moment Peterson is supervisor or co-supervisor for six doctoral candidates and several pre-candidates at Michigan. Peterson has examined doctoral dissertations at the School of Oriental and African Studies, the University of Oxford, the University of Durham, the University of Cambridge, and at several American universities. The doctoral students with whom Peterson has worked as supervisor are listed here. Joel Cabrita, Ph.D. (Divinity) 2008. ‘A Theological Biography of Isaiah Shembe, c. 1870-1935’. Currently Assistant Professor in History, Stanford University. Author of Text and Authority in the South African Nazaretha Church (Cambridge University Press, 2014). Nicholas Godfrey, Ph.D. (Divinity) 2008. ‘Understanding Genocide: The Experience of Anglicans in Rwanda, c. 1921-2008’. Currently Director of Summer Programmes, Girton College, Cambridge. Julie MacArthur, Ph.D. (History) 2010. ‘Mapping Political Community among the Luyia of Western Kenya, 1930-1963.’ Currently Assistant Professor in History, University of Toronto-Mississauga. Author of Cartography and the Political Imagination: Mapping Political Community in Colonial Kenya (Ohio University Press, 2016). Jon Earle, Ph.D. (History) 2012. ‘Political Theologies in Late Colonial Buganda’. Currently Assistant Professor in History, Centre College, Kentucky. Author of Colonial Buganda the End of Empire: Political Thought and Historical Imagination in Africa (Cambridge University Press, 2017). Ethan Sanders, Ph.D. (History) 2012. ‘The African Association and the Growth and Movement of Political Thought in Mid-Twentieth Century East Africa’. Currently Assistant Professor in History, Regius College, Colorado. Christopher Tounsel, Ph.D. (History) 2015. ‘Christianity, Race, and National Identity in Southern Sudan’. Currently Assistant Professor in History and Africana Studies, Pennsylvania State University. Edgar Taylor, Ph.D. (Anthropology and History) 2015. ‘Histories of an Event: The Ugandan Asian Expulsion of 1972’. Co-supervised with Nancy Rose Hunt. Currently post-doctoral fellow, University of Johannesburg Institute for Advanced Study (South Africa). Emma Park, Ph.D. (History) 2017. ‘Infrastructural Attachments: Technologies, Mobility, and the Tensions of Home in Colonial and Postcolonial Kenya’. Co-supervised with Gabrielle Hecht. Currently Assistant Professor, Department of History, The New School for Social Research. Ashley Rockenbach, Ph.D. (History) (2017). ‘An Uncertain Order of Things: Mobility, Governance, and Citizenship at the Margins of the Ugandan State, 1945-1990’. Co-supervised with Pamela Ballinger. Currently a member of the Social Studies faculty, Bard High School Early College Manhattan. Jonathan Shaw, Ph.D. (History) (2017). ‘Remembering Lions: The Simba Rebellion, Imagined Geographies, and the “Afterlives of Decolonization” in North Kivu, Congo (DRC), 1959-1973’. Currently a member of the faculty at the Université Chrétienne Bilingue du Congo, in Beni, eastern Congo. Benedito Machava, Ph.D. (History) (2018). ‘The Morality of Revolution: Urban Life, Moral Purity, and Citizenship in Socialist Mozambique, 1974-1988’. Co-supervised with Anne Pitcher. Currently Cotsen Postdoctoral Scholar in the Society of Fellows, Princeton University. Doreen Kembabazi, Ph.D. Candidate (History). ‘Beyond Control: Women, Youth and the Politics of Morality in 1970s Uganda’. Currently Mary Malcolmson Raphael Fellow, Center for the Education of Women, University of Michigan. Nana Quarshie, Ph.D. Candidate (Anthropology and History). ‘Confining Foreign Lunatics: Diversity, Migration, and Psychiatry in West Africa, 1887-Present’. Lamin Manneh, Ph.D. Candidate (History). ‘Making Mandinkas Muslim: Negotiating physical and spiritual space in Senegambia, ca 1800-1962’. Sara Katz, Ph.D. Candidate (History). ‘Mobilising the Hajj in Southwest Nigeria: Pilgrims, Technologies, and State Regulation, 1914-1990’. Co-supervised with Nancy Rose Hunt. Tara Weinberg, Ph.D. Candidate (History). ‘Property of the People: Land claims, law and power in 20th century South Africa’. Currently in South Africa, funded by the Social Science Research Council International Dissertation Research Fellowship program. Kristen Connor, Ph.D. Candidate (Anthropology and History). ‘Subterranea, Surface and Sky: A Multi-Layered Ethno-History of Western Uganda’. Currently in Uganda, funded by the Social Science Research Council International Dissertation Research Fellowship program and by the Fulbright (I.I.E.) program. Sauda Nabukenya, Ph.D. Candidate (History). ‘Pursuing Justice and Liberties: The High Court and Uganda’s Legal History, ca. 1900-1989′. 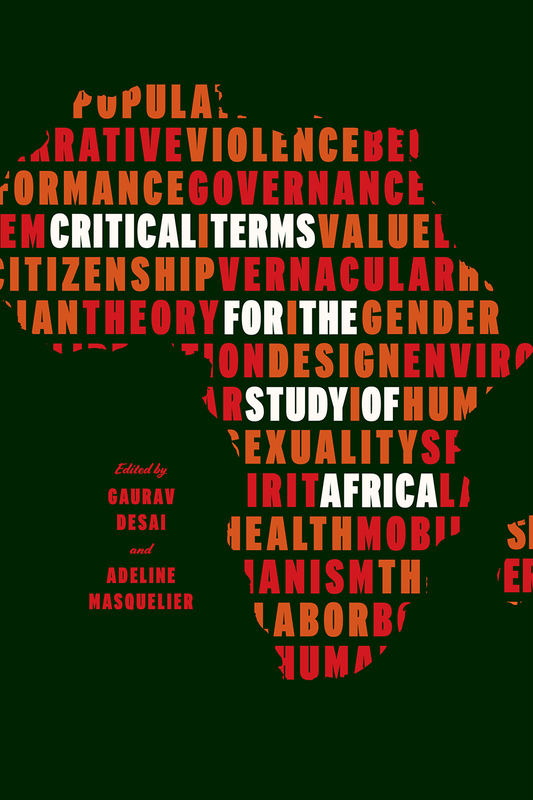 'Vernacular', Chapter 23 in Gaurav Desai and Adeline Masquelier, eds., Critical Terms for the Study of Africa (Duke University Press, 2018).